West Kennett Longbarrow, Nr Avebury, Wiltshire. Reported 8th July. Mark the annular eclipse of September 1, it closes the circle that started some 5770 years ago. On July 8, the date of the formation, the moon set conjunct Jupiter at the north node. This refers to the upcoming annular eclipse at the north node. This will occur after two draconic months on September 1 (thus again with the moon at the north node). On September 1, Neptune will still be at the south node and Jupiter approximately at the south node. The location at the Long Barrow shows a close relationship with the very past. The Long Barrow predates Stonehenge: the construction started about 3600 BC. It relates to the beginning of civilization. In this respect, it is very notable that a similar solar eclipse occurred at the same lunar node 5766 years ago in the year 3751 BC (on June 19, proleptic Gregorian calendar). The sun, the moon, the lunar nodes, Neptune and Jupiter where at the same position in the sidereal zodiac (for Jupiter there is a somewhat larger deviation) compared with the annular eclipse of September 1, 2016 (note: this is not true for the tropical zodiac). It is an event that occurs extremely seldom (very likely the only time in the very past). 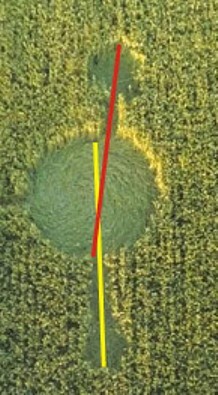 On the day of the formation this was also 50 × 9 × 13 tun (a tun = 360 days) as well as 90 × 90 Tzolkin-cycles ago (difference 8 days). The close relationship with the past connects the very past with the near future. It refers to the beginning of history, approximately the year 1 of the Hebrew calendar (5776 years ago) and connects this with a turning point in history short after the annular eclipse of September 1, this year. It possibly even predicts the end of history in the way we know it. Nowadays Pluto opposes the star Sirius and on the day of the formation, this was also true for the sun. In the year 3751 BC, Pluto was conjunct Sirius. Pluto is the planet of death and resurrection and this is another connection with the Long Borrow as a burial place.